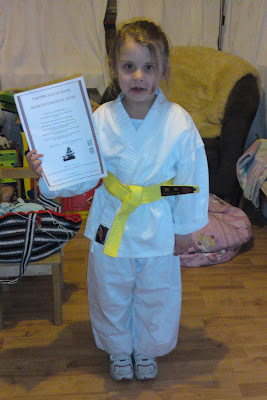 She's acheived the Karate grade of 8th Kyu (yellow belt). She was so chuffed with herself, and we were so proud of her. She works really hard in her karate classes (which especially shines out as some of the kids there just mess around and don't pay any attention to the Sensai) and its lovely to see all that hard work being rewarded with her first real grading. There's no stopping her now! Of course, she's not failed to mention the fact that she now has a yellow belt whilst me and Daddy still only have white belts with yellow tips! I can't believe I'm playing catch up with my 6 year old. She's never going to let me live it down either. I'd best get practicing my kata! !